When children demonstrate the skills they are learning, we can reinforce it by noticing and praising them. As busy as we are, we can’t let ourselves become too distracted to notice or take their achievements for granted. Genuine praise goes a long way in reinforcing positive behaviors. To do so, praise should be specific. For example, “It was thoughtful of you to help Grandma with her shopping.” is more specific than saying, “You’re so wonderful.” The first comment shows noticing and appreciation. The second comment sounds vague and canned. Sometimes as adults we get caught up in heaping enormous amounts of praise with statements such as “you are the kindest, the most wonderful, the most perfect” and it is difficult for a child to live on that pedestal. When they experience anger, frustration, or failure, it is harder to bounce back because perfect people don’t fail. Look for one or two things every day that your child has done where you can bestow genuine and specific praise. Ginsburg, K.R. & Jablow, M.M. (2011) Building Resilience in Children and Teens, Grove Village, IL: American Academy of Pediatrics. 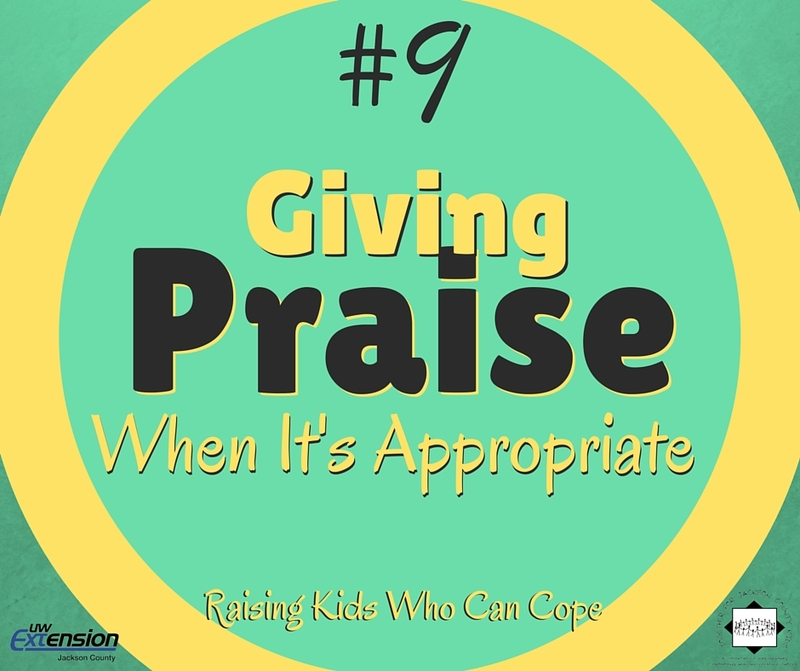 This entry was posted in Raising Kids Who Can Cope and tagged appropriate praise, coping skills, youth. Bookmark the permalink.